The piano, more than any other instrument, has the capacity to evoke the sound of a group of players. In the Dave McKenna version of ‘C Jam Blues’ that I transcribed in the last post, it could be argued that his left hand bass line and right hand melody line have just as much independence as do Slam Stewart and Don Byas in their duo version of ‘I Got Rhythm’. Great stride players like Art Tatum, Fats Waller and Teddy Wilson incorporated into their solo playing the chordal, bass and melodic parts that Nat King Cole later divided up among the members of his trio. Another category I have been interested in recently is that of great jazz pianists who excel in a duo context. For me, Kenny Barron’s work on the duo album ‘People Time’ with Stan Getz places him at the top of this list, although he has made many other great duo recordings, including his work with Frank Morgan and Regina Carter. One of the most important skills for the duo player is the ability to walk quarter or half note bass in the left hand while comping chords in the right. As an accompanist, I have always found that this is a crucial way of establishing a rhythmic connection with soloists, both those who are experienced musicians and those whose sense of rhythm needs some guidance. Throughout most of ‘People Time’, Kenny Barron and Stan Getz display a seemingly telepathic connection that allows both of them to play with great rhythmic freedom while still maintaining a clear sense of moving together. 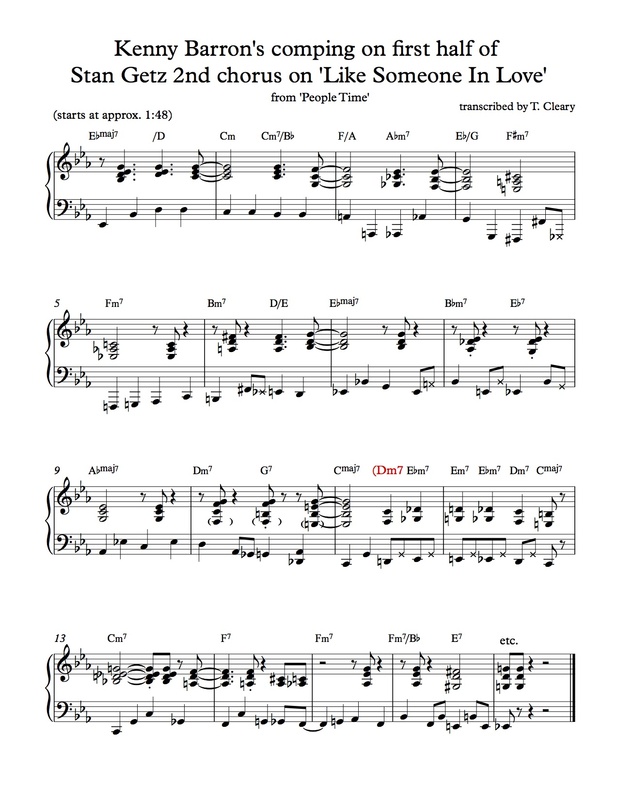 The excerpt I transcribed below, from Barron’s comping on ‘Like Someone In Love’, is a comparatively rare instance where his accompaniment of Getz moves into more deliberate timekeeping. It is a great example of an active quarter-note bassline combined with upbeat-oriented comping in the right hand. Although this technique is only one of many that Barron uses, for most jazz duo situations, the ability to combine strong left hand walking bass with upbeat-oriented comping in the right hand is a crucial survival skill for the jazz pianist. Barron also employs a number of refreshing chord substitutions on this great standard. I have transcribed just the first sixteen bars of this chorus, as my idea is that this should serve as a model for your own duo comping, rather than a score from which to perform. John Coates Jr. is what I would call a ‘municipal monster pianist‘ (the term I coined to describe Dave McKenna in the last post.) For more than 50 years, Coates’ home base was Delaware Water Gap, Pennsylvania, where he played at the Deer Head Inn. (As one newspaper article attests, Coates‘ playing was an influence on the young Keith Jarrett, who grew up in that area; a more recent article reports that Coates has relocated to California.) Much of Coates‘ recorded output is solo piano music in a style that might be called ‘improvisational folk-jazz gumbo’. The excerpt below, which showcases Coates’ straight-ahead jazz playing, is from a great version of the standard ‘Moonglow’ on a duo album he made with the fantastic vocalist Nancy Reed at the Deer Head in 2007. I was not aware of Reed’s singing before hearing this recording, but hearing her made me an instant fan; in addition to being a highly inventive and swinging vocalist, she is equally gifted bass player and I look forward to checking out her music more. 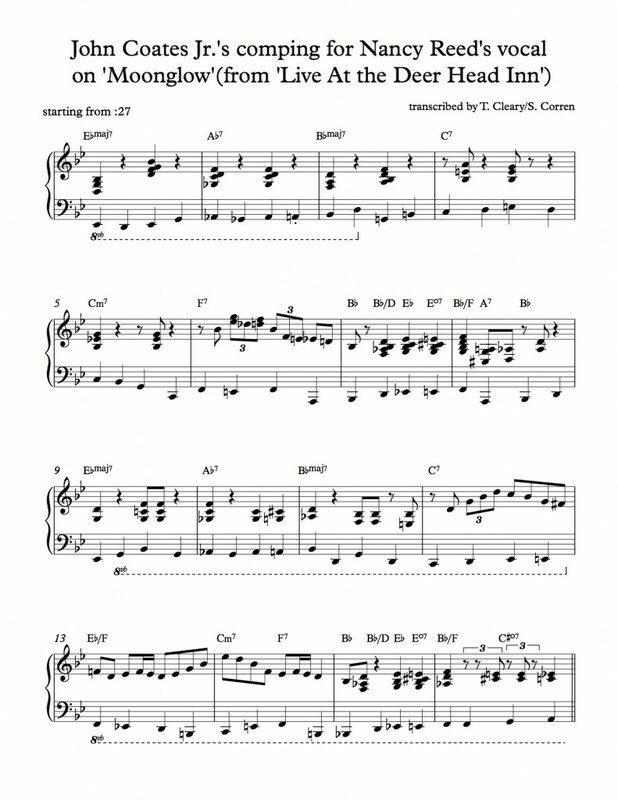 Coates‘ left hand walks in a manner similar to McKenna’s (although Coates’ bassline here uses an even lower range than the McKenna excerpt) while his right hand deftly alternates between chordal comping phrases and single-note fills. John Coates’ solo playing, documented on the collection ‘The Omnisound Years’, is the work for which he is best known and is well worth checking out. With interpretations of tunes by Neil Diamond, The Beatles and Cole Porter, this compilation suggests the catholic (in the sense of ‘universal’) breadth of Coates’ repertoire during the 1960s and 70s when the recordings were made. In his composition Prologue, Coates synthesizes these diverse influences, beginning with an intro that would be at home in an Elton John tune, progressing through some more jazzlike modulation and into a solo that makes shrewd and tasteful use of bebop language. Like the classic live recordings of Bill Evans at the Village Vanguard and Thelonious Monk at the Five Spot, on these recordings Coates is heard in a context of ambient sounds, including dinner conversation, clinking silverware and even a passing car at one point in ‘Prologue’. The listener gets a strong sense that this music was created in and for a particular social setting, and a particular room. Although the arc of the melody in ‘Prologue’ has a meditative quality, there is also an energy to Coates’ playing which I think derives from a natural inclination a solo player can develop in live situations to mirror the level of activity in the room where they are playing. In this piece one can also hear a number of stylistic elements that found their way into Keith Jarrett’s solo piano work by the time of his albums ‘The Koln Concert’ and ‘Facing You’. Postscript: I have always enjoyed duo work; some recent recordings I’ve done in that format include a version of eden ahbez’ ‘Nature Boy’ on vocalist Allison Mann’s album For My Mother and Father, and a version of ‘All of You’ that can be heard on the ReverbNation page for Birdcode, a new band that I’ve been working in with bassist John Rivers, drummer Caleb Bronz, and vocalist Amber deLaurentis. Yay! I Googled “left hand bass line right hand comping” and stumbled upon this wonderful post. This is a style I want to master and totally internalize, and I look forward to learning these transcriptions (and the pieces from Part 1) as part of that journey. If you have other repertoire you would suggest, I am all ears! Looking forward to exploring more of your posts!